Can’t stop, won’t stop: one of the well-known calling cards of Sound Mind Sound Body. Most recently, SMSB brought its tenacity for attacking and resolving problems in Detroit to the 48205 ZIP code, which has been labeled “Detroit’s deadliest area” by the Detroit Free Press. It also is a highly impoverished part of Detroit. The 48205 ZIP code, which reportedly has 44,045 residents, has 52.6 percent of its children living below the poverty line. The entire state of Michigan, in contrast, reportedly has 23.5 percent of its children living below the poverty line. A large reason why the 48205 ZIP code suffers deeply from poverty: a high level of unemployment. The unemployment rate in the 48205 ZIP code is higher than the Michigan average. It sits at 11.6 percent, whereas Michigan’s unemployment rate sits at 4.7 percent. Enter SMSB and its co-founder Curtis Blackwell, who has never found a challenge too large to take on. Blackwell, who grew up in the 48205 ZIP code on Chalmers St., took his staff to the Heilmann Recreation Center on Saturday, May 19, to participate in a day of giving back to the youth of Detroit. 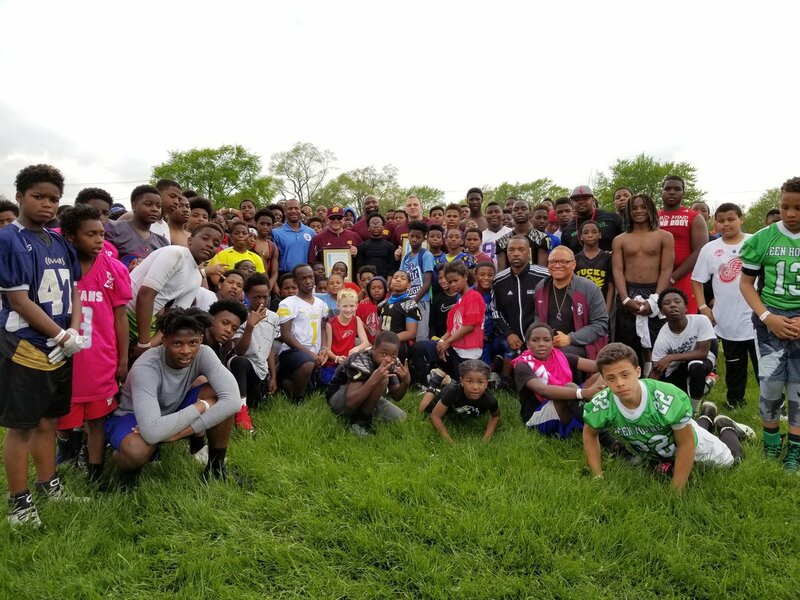 Along with the help of the Central Michigan University football coaching staff, including Chippewas head coach John Bonamego and director of player personnel Albert Karschnia, over 400 children were provided with a free day of taking part in drills and learning from some of the nation’s best Division I football coaches. The Detroit Police Athletic League (Detroit PAL) and the Detroit Parks & Recreation department also assisted in getting the event to come to fruition. 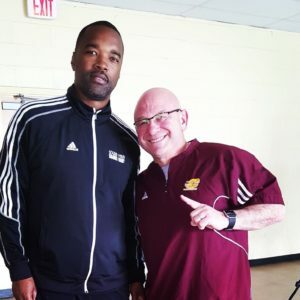 Grade school and middle school coaches benefited from the knowledge handed down by Bonamego and his staff, including CMU defensive backs coach and defensive pass game coordinator Cory Hall. He provided the coaches with information they can use to both become better coaches and to help their players develop into high-end talents as they get ready to take the next step in their football careers. 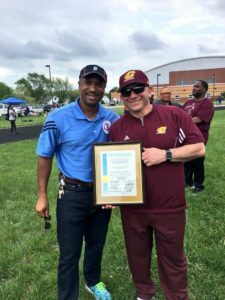 For his efforts and the efforts of Hall and Karschnia in providing tutelage to the student athletes and their coaches that gathered Saturday, they were each presented with a “Spirit of Detroit” plaque by Detroit City Council member Scott Benson. Detroit City Council member Scott Benson presented Bonamego with the “Spirit of Detroit” award. Proven leaders, like Blackwell and Bonamego, are able to make differences in all the communities — small and large — that they travel to and spend time in. Now, the plan is to bring this fun and free camp for the youth to other parts of Michigan. Remember, when it comes to impacting the youth both on and off the football field, the sky’s the limit with Sound Mind Sound Body. Follow the writer of this article, Vito Chirco, on Twitter @VitoJerome.